Happy 4th of July from CCA! The 4th of July is about celebrating our country, homes, friends, families, and all of our blessings. It’s easy to get caught up in daily stresses so this holiday is a wonderful chance to focus on what is meaningful in our lives and remember how lucky we are. A few of us are new to the Bay Area, so it was a particularly good way to celebrate our new home! Naturally, everything was accompanied by fantastic food and wine. As the daughter of a Naval Officer, July 4th holds a lot of significance for Kimberly. She loves gathering with old and new friends for the 4th, and this year she had friends in town from Vancouver, Canada, and wanted to give them a truly American holiday. Her friends from the catering firm Tango & Stache, chef Joshua Wilder Oakley and Ryan Robles, hosted a sumptuous party at their Potrero Hill home. Their home is full of culinary antiques such as butter churns, old-fashioned coffee grinders, cast iron pans, and myriad other memorabilia that celebrates the generosity and hospitality saturating their home. Josh grew up learning to cook by his Louisiana grandmother’s side and adds a special homegrown Southern touch to his kitchen magic. He prepared grilled chicken with herbs; hoecakes with homemade ricotta, bacon and chives; macaroni & cheese with duck confit; and buttermilk strawberry shortcake. They also enjoyed “adult” punch with lady apples, sour cherry preserves, fresh mint, lemonade and vodka. Alongside the chicken and duck confit, they paired some lusty Syrahs to complete a perfect evening of culinary hedonism. To top it all off, they all gathered at the top of Potrero Hill to watch the fireworks over the Bay, pass out sparklers to the little kids, and toast their good fortune. Katie is still pretty new to the area, but has certainly settled into her surroundings! She spent the 4th barbecuing at her house in Hayes Valley with friends and neighbors. They enjoyed a true California-style 4th, complete with tri-tip steak and vegan tacos, cold Sierra Nevada, and a bounty of delicious strawberries and cherries for dessert. Once the sun went down, they headed over to Alamo Square, where they also enjoyed the fireworks (including a few that their neighbors set off in the park—it was like having their own private show!). It was a fabulous 4th and the beginning of a wonderful new tradition in California. Skye spent the 4th home in Napa Valley, surrounded by family and friends, great food and unbelievable wine. There’s a great view of the annual fireworks at Martini Winery from the end of her street, so the whole neighborhood brings chairs, blankets and wine to enjoy the show together. At the end of the night, they all sat around a bonfire in her backyard, eating homemade white nectarine and peach cobbler and sipping on tisane tea made with fresh herbs from her family’s garden. All in all, it was a magical evening and a wonderful time with family! Drew sums up his 4th of July this year as “epic,” and it certainly was filled with great times and traditional American activities. He started off the holiday early by going to watch fireworks on the night of the 3rd in Windsor with family friends. On the morning of the 4th, he had a large brunch with his mom, uncle and grandpa (his dad is still in India putting together final wine blends). After brunch, he and a large group of friends barbecued, tossed the football around, and swam in the Russian River at his buddy’s ranch and vineyard. Drew, his mom, and some family friends then went bass fishing and he caught a big bass! To finish the day off, they all had dinner at the Vineyard Club on the lake in Geyersville, which included delicious food, kegs of Sierra Nevada (a trend here), home-brewed beer, and great wines. Finally, CCA would like to announce our two awesome summer interns, Eddie and Emma. Eddie spent the 4th at his best friend’s house in Stockton. Since they go to college in different states, they don’t see each other much and look forward to spending time together over the holidays. They spent the day in the backyard, hanging out by the pool, basking in the beautiful weather, and, of course, grilling up a storm! The entire afternoon was dedicated to grilling vast amounts of BBQ spare ribs, sausages, and tri tip steak. They then watched fireworks from his friends’ roof and happily reminisced over old times. Emma is brand new to San Francisco, but is having a blast living in the Mission. 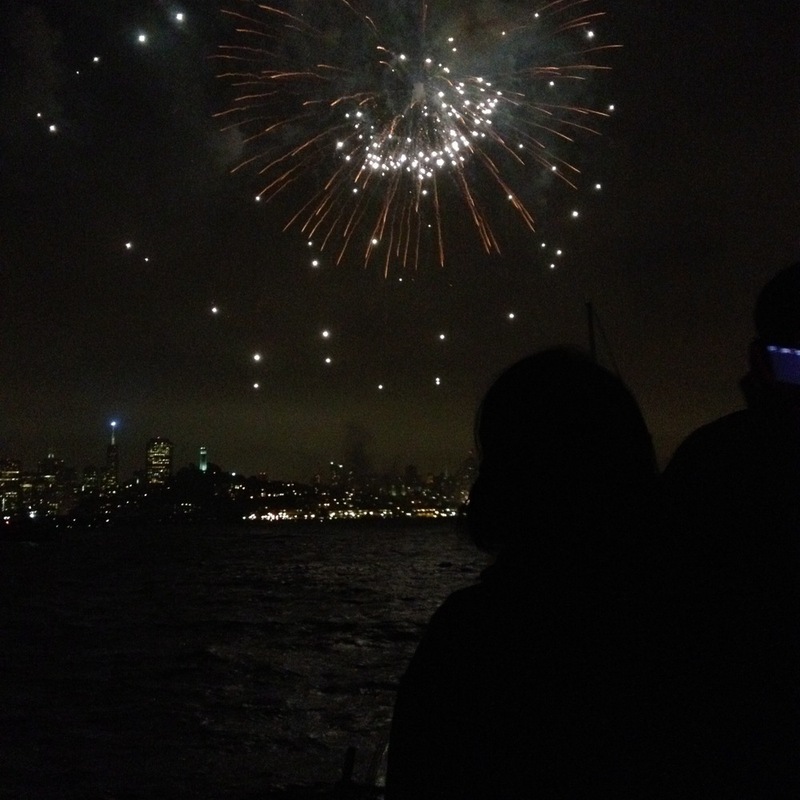 A Stanford friend’s cousin runs a fishing boat in the Bay, so she went out with a group on that to watch the fireworks from the water. They were so close that you could smell the ash as they lit up the sky overhead, and it was a perfect welcome to the city. Happy 4th and have a great summer!